Endangered Species Day – Gone Fishing! I also want to remind you that there are only 24 hours left to the Children’s Book Week Giveaway Hop! More than 90 bloggers are participating…hurry over and win some great prizes!!! I’m giving away a copy of Show Me How! Build Your Child’s Self-Esteem Through Reading, Crafting and Cooking PLUS some crafting supplies and a copy of The Tales of Peter Rabbit. I’d also like to update you on the Asian Festival of Children’s Content – LESS THAN ONE WEEK TO GO! It’s hard to believe I will be half-way around the globe next Saturday. What an amazing opportunity and honor! The Asian Festival of Children’s Content impacts 1.5 billion children in Asia as well as their parents, professionals, and businesses involved in their development. Yesterday morning, I Skyped with one of my panel-mates who lives in London and tomorrow I will be Skyping with the two speakers who will be sharing the second panel discussion with me…one lives in Singapore and the other in the UK. My picture book pick today celebrates Endangered Species Day. “Dive down to the depths of our planet’s oceans and see the stunning variety of creatures that call this watery environment home. These incredible marine animals and their ocean habitats are among our most precious and endangered resources. 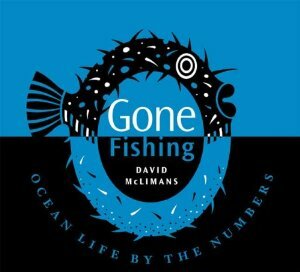 Using animal-shaped numbers from 1 to 10 and back again, McLimans introduces various marine creatures and their survival status. An African penguin, sea lamprey, tiger tail sea horse, and blue-ringed octopus are among the featured species. The boxes include the class to which each marine animal belongs, its habitat, aquatic region, threats, and status (“vulnerable,” “endangered,” and “critically endangered”). Between the count up and count down is a spread of “Ocean Facts by the Numbers,” which presents various statistics in the power of 10. For example, “Less than 1 percent of water on Earth is freshwater,” “Plastic waste kills up to 1 million seabirds every year,” and “About 1 billion people live in coastal urban centers, and the resulting overdevelopment threatens almost 50 percent of the world’s coastal habitats.” The black silhouetted numbers are sinuous and compelling in this unique and imaginative description of the dangers facing ocean life today. The publisher states the book is age 7 and up…and Library Journal recommends it for grades 3-5. However, the illustrations are wonderful and younger children would enjoy looking at them with their older brothers or sisters. It’s important to raise kids’ awareness early on about endangered species and the effect pollution and human habitation are having on nature. You will need: Sticks or wire hanger, string or yarn, construction paper, scissors, markers. 1. Draw fish and decorate with markers. 2. Punch a hole at the top of each fish and thread in a piece of yarn. 3. Tie to a wire hanger at different levels. 4. 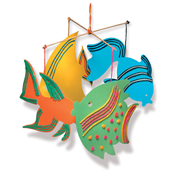 Hang up and watch the fish swim in the breeze. This entry was posted in Uncategorized and tagged 2013 Asian Festival of Children's Content, Children's Book Week Giveaway Hop, Endangered Species Day, Gone Fishing: Oceans by the Numbers, Perfect Picture Book Friday, Vivian Kirkfield by viviankirkfield. Bookmark the permalink. I HAVE to get a copy of GONE FISHING, and I know I would love it. I usually don’t review books for the older kids, but this one looked really special. Thanks for always stopping by, Joanna! I always enjoy the crafts you add. One week to go, yeah! I like the idea of this book! 😀 AWESOME activity! Barvo! As one who lives with the sea all around them and very aware of preserving ocean life, this is very attractive indeed. Great review, thanks for sharing, Vivian. Oh my, only a week to go then you will be on the same day as me and only 4 hours behind…lol. See ya soon! This book sounds great! A good choice for a special day! I love quirky counting books that capture your imagination. Thanks for sharing this one! Thanks, Nancy! I keep finding more things to put in the suitcase…Aarggggg! Gotta love anything that helps young children see our planet as the fragile thing it is. Nice review!